- Good afternoon! First of all, many thanks to all those present for being here today. 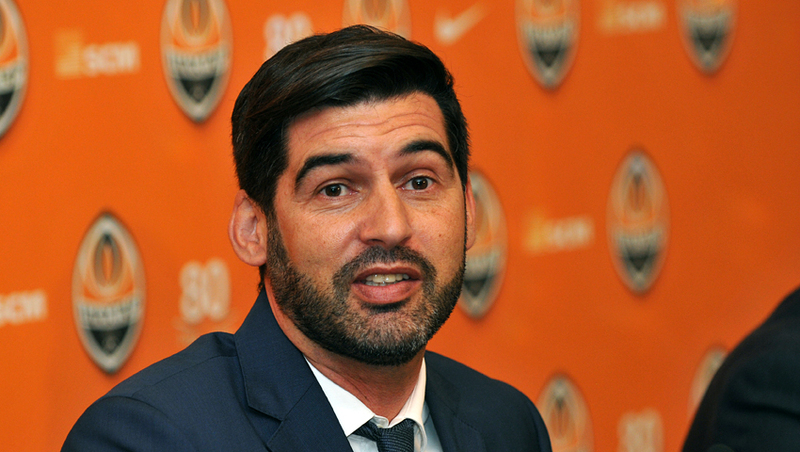 For me it is a great pride and happiness to become head coach of Shakhtar. I want to thank the president and the club management for the opportunity. We will try to do our job in the best way possible! - It’s nice to see you in Ukraine again! How can we, the journalists, address you? - Thank you. Most frequently, they just call me Paulo or Paulo Fonseca - whichever you prefer. - Tell us about the transfer policy and the coaching staff to have joined Shakhtar with you. - With me will come the coaches I’ve already worked with. I know them very well. My main assistant is Nuno Campos, the coaching staff will include Pedro Moreira, Tiago and Antonio, who will work with the goalkeepers. Also, Miguel Cardoso and Igor Duljaj will be helping me. As for the transfer policy, basically, I am very pleased with the current team squad. Of course, I will have to review all the players. To do that, we have a few summer break months. I will speak personally to each player and see what he can do, what kind of person he is. Perhaps, in the future, we will be making some changes. But at the moment I am completely happy with the players we have in the team. They are quality players, and I think that it is not necessary to change anything radically at the moment. - Given the fact that Ukraine is not the most peaceful country in Europe at the moment, is your family planning to come and live with you in Kyiv? - My wife and children will stay in Portugal, but it has nothing to do with the political situation and the instability in Ukraine. My son is 16 years old, and the daughter is 11. Children attend a school, and they simply cannot that quickly change the country and language. Of course, I think that my wife and children will often come here, as we cannot stay without each other. We'll see each other. Furthermore, my wife does not want to risk it, because he knows that there are very beautiful girls in Ukraine! - Mircea Lucescu continuously held the summer training camp in Going, Austria for the recent years. Do you have a similar favourite place for holding training camps? Where do you plan to hold it with the team? - Basically, we have considered several options for summer training camps, but selected the Netherlands, where a number of top teams conduct their training camps. I've already been there. I think this is a very good place to prepare for the new season. - When the Pitmen played against Braga in the Europa League quarter-finals, did you receive any signals of interest on the part of Shakhtar at the time? Or it started happening after those matches? - No, when we met with Shakhtar in the UEFA Europa League, I have not even dreamed of and never thought that I could be here. It all happened after those matches. - Paulo, many Shakhtar players speak Portuguese. But besides them, there are other players. Are you going to learn English, Russian and Ukrainian languages? - That is one of my first objectives - to learn the Russian language to communicate with the Ukrainian players. I think in the nearest future I will be able to talk to the lads. Now I know the Russian ‘Hello’, ‘Thank You’ and ‘Ball’. - At the clubs you used to work for, you had your favourite player - Josué. Is it much likely that he will continue his career at Shakhtar? - You know, in the world of football, sometimes they say that he is my football son. To be honest, as long as this is not possible, we have not considered it. - What are your goals for the team? - As I have said, I am fully satisfied with the current squad and I hope that none of the players will leave. Again, we will try to see each of them, analyse and make a decision afterwards. We also need to pay attention to the talented young Ukrainian guys, who showcase excellent football. Over time, they can mature and become the top players. I think Shakhtar has done a very good job in this regard, and that these players will be able to ensure a happy future for the team. But we shouldn’t forget about the internationals either. That way, we will be able to claim victories. - Paulo, your predecessor Mircea Lucescu said a year ago: the main reason for the team not to have won gold medals for the first time in five years, is that Shakhtar have not been playing at home, holding matches at other arenas. Is that a problem for you? Did that fact distract you when you were going to join Shakhtar? - You don’t know me well yet, but, I think, everything will change over time. I never look for any excuses. If the team lose, I take all the blame upon myself. When I decided to sign a contract with Shakhtar, I perfectly understood the club’s situation, as well as the fact that the games are not held at home. I hope that we will be winning and that this question won’t be relevant at all. - Your first official match as the head coach of Shakhtar will be the Super Cup tie against Dynamo Kyiv. How important is it for you and what do you know about that major rivalry? Are you ready for the pressure from the fans early in the game? - In fact, I am fully ready for the first match and I have no fears in this regard whatsoever. I know that the biggest rivalry in Ukraine is between Shakhtar and Dynamo. I believe that with our squad, we can achieve good results. Sergei Palkin has said that for the last two years, Dynamo have been winning the league title. Hopefully, we will be able to change everything now, to claim the top spot, making shirting Kyiv to the second one. This is one of our major goals. - The chronology of your career shows that none of the clubs had you for longer than a year. Is that your trait? Or so were the circumstances that after each season they invited you to a bigger-profile club? - This has nothing to do with my character. Most often, it just happened. And it happened for the best! I hope that Shakhtar will be the turning point, where I work for more than one year. I signed a contract for two years, but I hope that it will last longer. - Do you fine your players? If so, what for then? - I'm a big fan of discipline, but at the same time, I am not a dictator. There is a certain number of rules for the team to follow. I am not going to specify them now, because the players don’t even have an idea about them. Of course, I fine players if those rules are violated. But I do that not to retain the money. I put it aside, so that we could have dinner with the whole team at the restaurant and discuss the fact that we need to follow the rules. - Your predecessor Mircea Lucescu has achieved considerable success at Shakhtar. How much pressure will you feel working for the club after that kind of mentor? - The pressure and huge responsibility form one of the most important components of any coach’s life. If he's not ready for that, he should not be a coach. Therefore, I am fully prepared and know what I want - to claim victories and win trophies. I will lead my team to that. - What didn’t work for you at Porto? - I am an individual who is trying to look into the future and not think about what happened in the past. Today is a very important day for me - I have signed a contract with Shakhtar. Therefore, we will think only about something good. At the same time, I do not want to run away from the question. If we talk about the period I spent at Porto, I want to say that the season was not very successful. As I said, I don’t blame anyone but myself. Apparently, something went wrong, but those things happen in football, it's okay. Look at the giant teams and their coaches. For example, Mourinho did not quite have a good season at Chelsea. Now it is important to tune in to Shakhtar and try to develop together with them. But I want to make it clear that over the year I spent at Porto, I think I got the most skills in my career. - Did Miguel Cardoso, the man who has worked here for several years and who knows the specifics of the country and club, give you any advice? - I am confident that Miguel is already well versed in both Ukrainian football and the main traditions of this country. It will be very helpful to me. We will see in the course of the work what we should expect. - How many hours a day do you spend on football? - A lot! I believe that certain balance is important in everything. When you come home, it is better to take the time and spend it with your wife and children. But personally, I can never forget about football. Coming home after a match or training session, I still think about it. Although, again, there should be some balance – that’s the key to success. - Paulo, how many Shakhtar games have you watched, and which ones impressed you? - Lots of them. You know, while I was at Braga, we prepared and reviewed them. Which I liked? Basically, many of them. I can tell you for sure which I didn’t like: against Braga, when we played each other. - Senor Fonseca, is it possible to say that you, as a coach, like to control the ball and spend a lot of time on attacking positionally? Did you pay attention to the fact that this spring Shakhtar had to change their tactics significantly due to staffing problems? Your predecessor Mircea Lucescu has achieved success in the Europa League largely through the counterattacking performance. Are you ready to change? And how much does Shakhtar’s staffing potential correspond to your vision? - I will try to introduce my new ideas and somewhat change the style of play of Shakhtar. I have already said that I would try to strengthen the defensive third - it will work quite differently, not the way it used to operate under Mr. Lucescu. Also, the team will undergo little changes in the offensive third. But you will see all that later. I do not think it’s worthwhile discussing it in detail. But I would put it like this: there will be major changes that you just cannot but notice. - You mentioned Jose Mourinho, who once headed Chelsea and said he was the Special One. Jürgen Klopp at Liverpool said that the former was just a Normal One. What can you say? - It is hard to answer. I do not want to be called in a special way. I am myself, a very ambitious coach who believes in his work. You can call me special only after achieving some results. Then it will be up to you to decide. - Eight players of Shakhtar will play for the national team at EURO 2016: someone among the first XI, while someone else will start it on the bench. You have the Super Cup and UEFA Champions League qualifying stage ahead. Have you thought about how you will give some rest to the players who go to France? - We have drawn up a programme. Of course, after international duty, the guys will have to rest. By the way, I am very pleased that so many Shakhtar players have been called up by their national teams. From now on, Ukraine national team has another fan - I'll be rooting for them wholeheartedly. Would I like them to be here at the moment? To be honest, yes – this way it would have been better for Shakhtar. But now they are part of the national team, which is also good. We have some great guys who can adequately replace them. - On the eve of the match in Braga, you had a very long conversation with Mircea Lucescu. What was this conversation about and what do you remember the most? - It wasn;t long, We just exchanged a few words. I remember that Lucescu asked me for a chair, because there wasn’t any in Shakhtar’s dressing room. And I brought it there. I was also impressed that Mircea Lucescu is very fluent in Portuguese. - Will you support the tradition of holding open trainings for journalists? - Of course I will. I believe that journalists’ dialogue with the team is very important. Without any doubt, we will hold open training sessions. - Tell us about the specific features of summer training. How many friendlies have you scheduled and what your charges should expect – running work or handling the ball? - Our sessions and traing camp will begin in Kyiv. We will spend a week here and get acquainted with all the players. Then, we will fly away to Holland, De Lutte, where we will spend seven days, and then we will go to the city of Horst, where we'll stay for another week. We’ll get back back just 3 or 4 days before the Super Cup of Ukraine. What will the training camp be like? Regular just as any other team. Of course, we will discuss new ideas. I will try to convey to everyone what is required of them, so that all players are aware from the very beginning of our work together. I love to dominate in football and retain the ball. This is the most important thing I am going to teach my players. - You have repeatedly said that the sports component is more important for you than the financial one. Did you observe that principle when moving to Shakhtar? - Yes that’s true. I want to repeat it one more time today. All the decisions I have taken in my career were based more on the sports interest rather than the financial one. And with moving to Shakhtar, this principle has not changed. I came here because I want to build a good team and win titles. That’s our most important goal.